There is just something about biscuits. I know it’s a southern thing, and I am an unabashed Yankee, but I love (LOVE) a good biscuit. I implore you to overlook the gluten-free and vegan aspects of these because they taste like the real thing. But more moist, because they’re full of butternut squash. Can you even handle it? I can’t. I had to give most of the batch away because I would have eaten all eight in one sitting. Eat them with BBQ, like we did, or as a breakfast sandwich stuffed with a fried egg. Or just each a few, slathered in butter, as a meal. The recipe makes eight, after all. But seriously, these are delicious by anyone’s definition because they’re easy, forgiving, and adaptable. If you aren’t a fan of butternut squash, swap in pumpkin, acorn squash or even sweet potato puree. 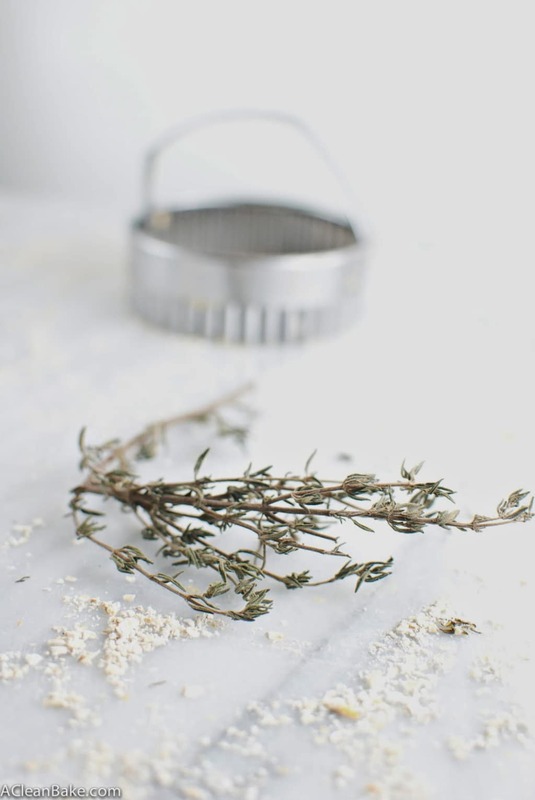 If thyme isn’t your thing, rosemary works fantastically, or replace with freshly ground black pepper (just reduce the amount), or leave out the spices entirely. And make sure you use fresh, rather than dried, spices if possible because they are the most pungent and will impart the most flavor. The best way to have fresh spices on hand without having to spend a fortune on those little plastic clamshells constantly is to buy them when they’re on sale and freeze them, rinsed and fully dried, for up to 6 months. For these, I used thyme from my CSA last fall that I had frozen for a rainy day (and by rainy, I mean wanted a biscuit). 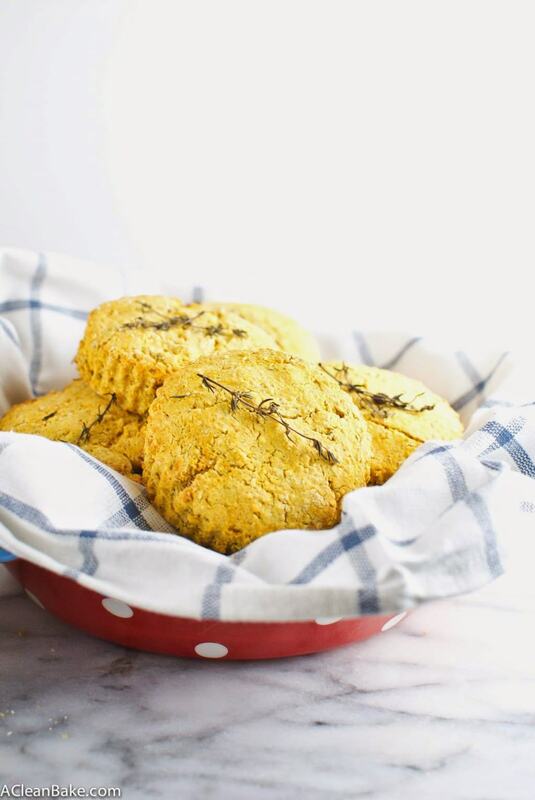 These biscuits are crisp on the outside and moist and squishy on the inside, and their texture is ripe to absorb a salty pat of warm butter. 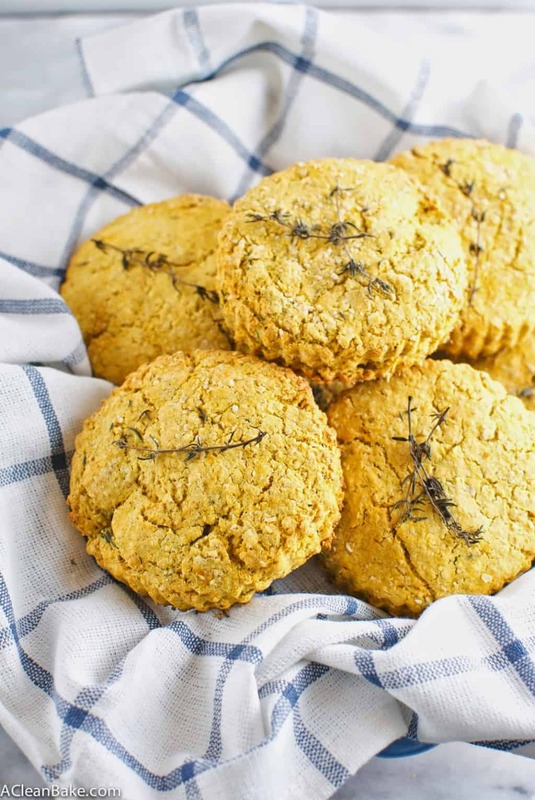 They’re made with oat flour, so they’re a little heartier than your typical biscuit, which makes them worthy of a place on your plate, rather than a nearly-forgotten side than sits next to your plate while you devour your meal. The squash is slightly sweet, and the thyme is pungent without being overpowering; they balance each other perfectly. Try these. They’re familiar and surprising, healthy but still carby and comforting, and most of all, they just make the meal. Make the vegan buttermilk but stirring together the almond milk and lemon juice. Put it in the fridge to curdle a little while you are preparing the rest of the ingredients. In a large mixing bowl, combine flours, baking soda, baking powder and salt. Whisk together a few times to combine and aerate. Stir in the puree. Mash it a little with the back of a fork if necessary; keep combining until the mixture forms pea-sized chunks and is very crumbly. Use a pastry cutter to cut in the butter. Mix in the buttermilk to form a dough. 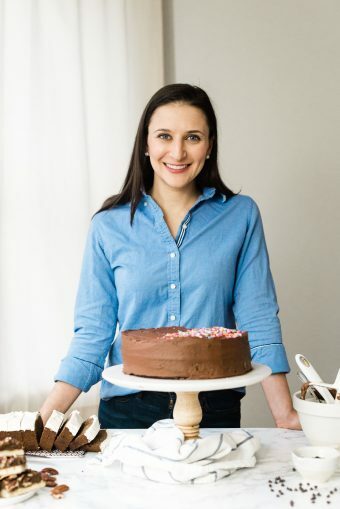 You may not need all of the buttermilk; add it little by little, just enough for the dough to hold together when you press it into a ball with your hands. It may be a little tacky, but try not to let it get goopy. If you add too much liquid, add an additional Tablespoon of oat flour to even it out. Gather dough into a ball and turn out onto a floured cutting board. Sprinkle additional flour on top of the dough ball and roll out to about 3/4″ thick. 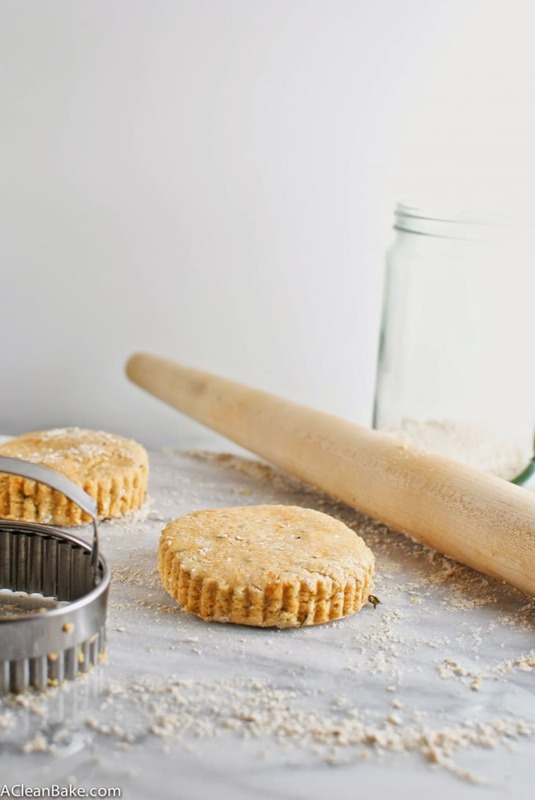 Use a biscuit cutter to cut out circles of dough. Lay them in a single layer on cookie sheet covered with a nonstick pad or parchment paper. 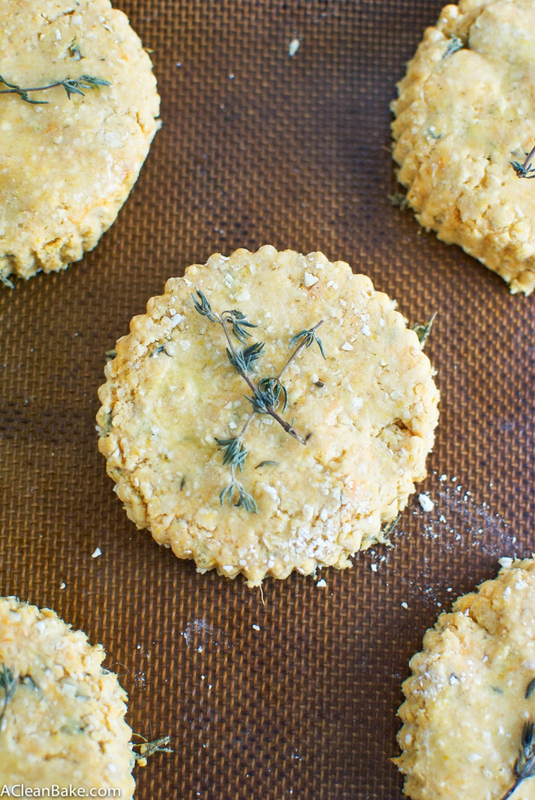 Brush the tops of each biscuit for a little bit of melted butter, then gently press a sprig of thyme on to the top. 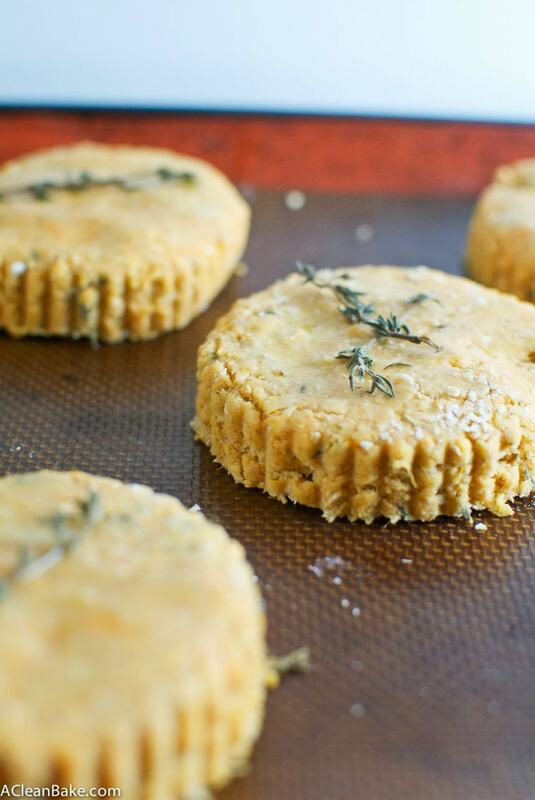 Refrigerate the raw biscuits for a minimum of 30 minutes (if more than that, store in an airtight container). Bake 15 minutes until biscuits puff up slightly and begin to crackle on top. what can i replace the vegan butter with? Grass fed (dairy) butter or coconut oil should work!